Some games get better with age. This year marks the tenth anniversary of one of the most influential games ever made, Halo. To celebrate, 343 Studios is releasing Halo Anniversary, which gives the classic shooter a brand new modern-day look. Wisely recognizing that fans would riot if they messed with the original Halo too much, 343 kept the gameplay completely intact. The game runs on the original Halo engine, with the same physics, AI, and scripting that it always had. A new graphics engine runs simultaneously, giving the classic shooter an up-to-date look. It may look brand new, but this is the same old Halo you've grown to love - flaws and all. Anything you could do in the original game, any glitch you could exploit, you can still do here. Warthog jumps, grenade tricks - you can still do them all. The two-engine system also allows for a bit of nostalgia on the fly. You can hit a button at any time to turn off the new graphics engine and return to the old Halo look. It's a fun little time machine that really shows off just how far graphics have come in the past ten years, but you know, Halo still looks pretty good, even a decade later. 343 was hands off when it came to gameplay elements, but that doesn't mean Anniversary doesn't benefit from a bit of tweaking here and there. In areas like The Library, where everyone got lost, new textures and lighting have been added to help point the way towards the exit. 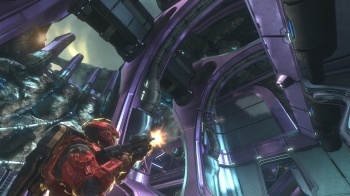 Other areas have received similar modifications, and new terminals have been added that will help explain Halo's story. The multiplayer will include 7 maps: 6 competitive multiplayer and 1 firefight map. Most are from Halo, but the rest were cherry picked from other games in the series. You can expect to find out more about the multiplayer during HaloFest, a celebration of Halo's 10-year anniversary to be held later this year at PAX. Halo Anniversary will be released on November 15th, the exact day the original game came out oh, so long ago.